The Istrian peninsula is at the northwest end of the Croatian coastline. It is closest to Italy both culturally and geographically. 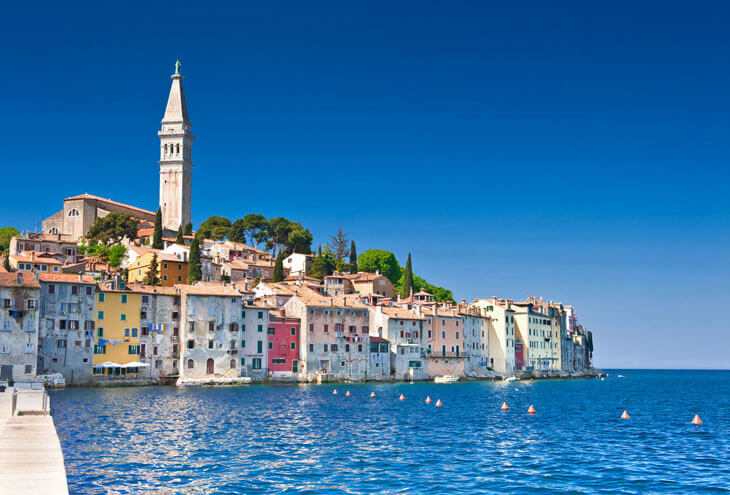 Istria is a very popular tourist destination and well connected with airports at Pula and Rijeka (on the island of Krk) and within easy reach of Trieste Airport in Italy and Ljubljana in Slovenia. The Istrian coastline is characterised by the string of beautiful small Mediterranean towns along its western coast. These include Umag, Porec, Novigrad, Vrsar and the outstandingly picturesque Rovinj with its spectacular narrow streets leading up to the church of St Euphemia in the heart of the old town. These Istrian towns were all important outposts of the Venetian Empire and still display the atmosphere and architecture of that era with their charming squares, narrow pedestrian streets and alleyways, and delightful cafes and restaurants set around busy harbours packed with local fishing boats. The port of Pula at the southern end of the peninsula, an important city from Roman times, is famous for its original 2nd century Roman amphitheatre and other Roman monuments as well as it large sheltered harbour and many beaches and resort areas with fine cuisine. The eastern coast of Istria is less developed with the most notable resort at Rabac. The deep estuary of the Rasa River is totally unspoilt. The north east of the peninsula is characterised by a mountain range with the highest peak, Mount Ucka visible from Pula in the south on a clear day. Crossing these mountains (there is a road tunnel under Mount Ucka), one enters the area of the Kvarner Riviera with its sumptuous resorts of Opatija and Lovran. Central Istria is a tourist destination in its own right. Often described as the “new Tuscany”, the area has a rolling green landscape of vineyards, olive groves and forests and is studded with preserved and charming medieval hilltop towns, offering breath taking views across the surrounding countryside, often extending to the Adriatic coast. There are any number of places to visit but the most notable are the fortified town of Motovun with its acclaimed international summer film festival, the tiny but delightful Groznjan a designated cultural centre alive with music and art galleries and Oprtalj, with a faded medieval grandeur and wonderful peacefulness. Istria is a great destination for lovers of good food and wine. There are first class award winning wines and well signposted wine routes to follow where you can visit famous wine growers and buy from them directly, whilst sampling some of the local food specialities. Central Istria is also one of the few areas in Europe where truffles grow naturally in the dense forests around Livade. Inland Istria has numerous excellent restaurants excelling in meat and pasta dishes using world class local truffles in generous proportions. Truffle lovers will be overwhelmed by the sheer quantity of truffle served at very reasonable prices. On the coast the restaurants will tend to focus more on freshly caught seafood and the overall culinary style is heavily influenced by Italian cuisine. There is so much to recommend Istria to you. For a start, over 300 days of sunshine a year. Did you know that it takes only 2 hours to Istria from the UK and most European destinations? The sea is clean, clear, warm and safe to swim in. There is a new world class golf course by the sea near Umag and others are planned. The food and wine are of extraordinary quality, and accommodation ranges from wonderful villas with pools and character cottages to boutique hotels and sea view apartments. It is the right choice of vacation for families with children, or adults only, for romantic weekends and honeymoon couples, food and wine lovers, music festival goers, bicycling enthusiasts and all watersports, with one of the top windsurfing spots on the Adriatic. After all that, you can spend a few hours or whole days on discovering the cultural and historic gems of Istria by yourselves or with our excellent multilingual local guides. You will have a wonderful holiday, to which we shall pay our personal attention to make your vacation experience most memorable.